Samsung is promoting the Omnia, (i900) launched in July and August 2008, with an interactive web site, 42 Good Things. 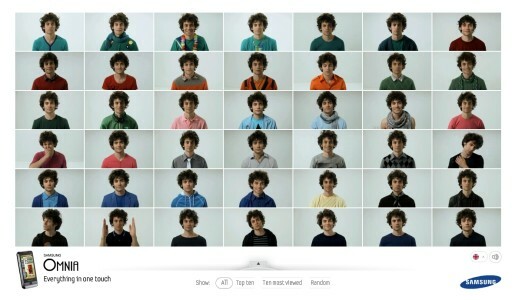 Today’s site of the day features 42 short commercials using the same actor in each. The site is available in English, Svenska, Norsk, Finnish and Danish languages. By clicking on the circular viewer in the bottom centre you can narrow your choice of videos down by feature: video player, GPS, video camera, blogging, good connections, pocket office, games, lots of memory, clever solutions, internet, camera, music and radio.